When PUMA signed Rihanna it was a huge gain for the company. Rihanna has long been seen as a ‘fashionista’ – pushing the envelope of style and taking risks and it made sense that PUMA wanted her on their team. With her first release, “The Creeper”, Rihanna has created quite a stir throughout the sneaker world. The name, “Creeper”, isn’t new. A Creeper style shoe is any shoe set atop a platform – usually 2-3 inches – most often with a chunky, ridged sole.Creepers can be Oxfords, Mary Janes, Loafers, and most definitely sneakers. Rihanna’s Creeper is a platform-take on PUMA’s classic suede. 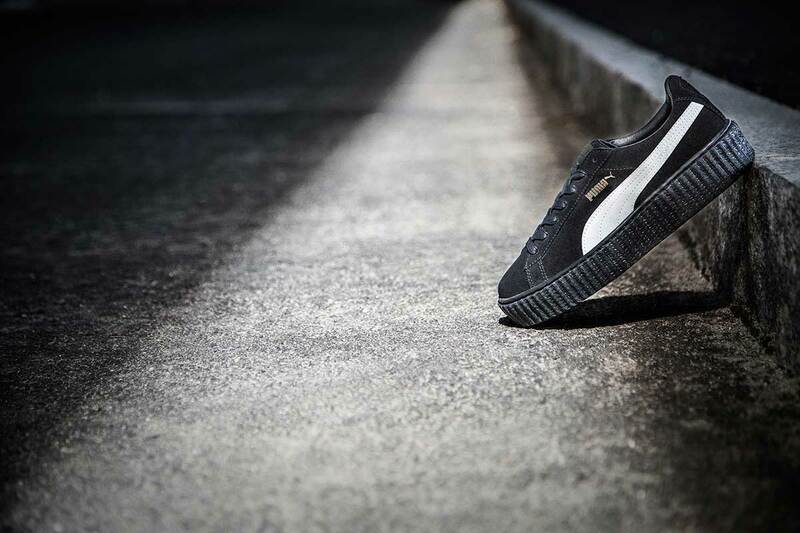 The PUMA suede has long been a staple in the collection of PUMA lovers and it makes sense that Rihanna chose that style for her first design. The upper portion of the shoe is a straight suede silhouette. It features the PUMA stripe and gold foil “PUMA” on the side of the shoe. 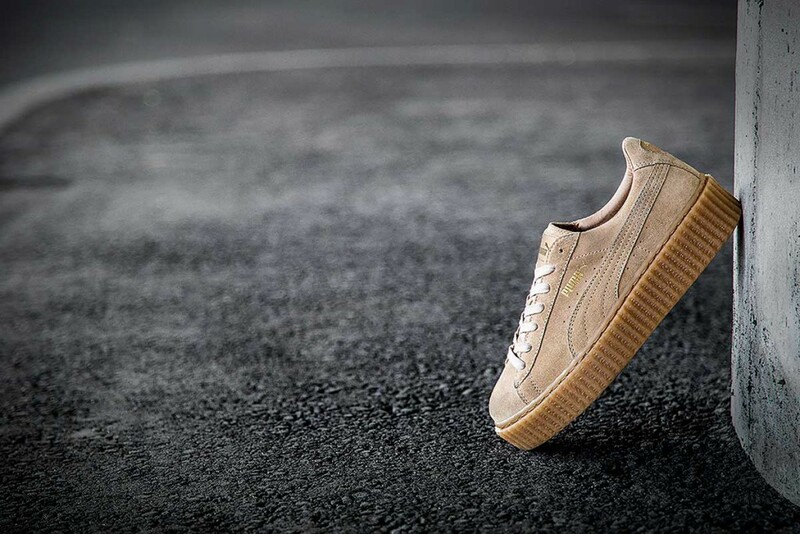 The tongue features a large, square tag with gold writing that says, “PUMA by Rihanna” in the same color as the shoe. The only deviation from that tag is the all-black colorway. The writing on that tag is black and blends into the label. That is where any similarities to the suede stop. 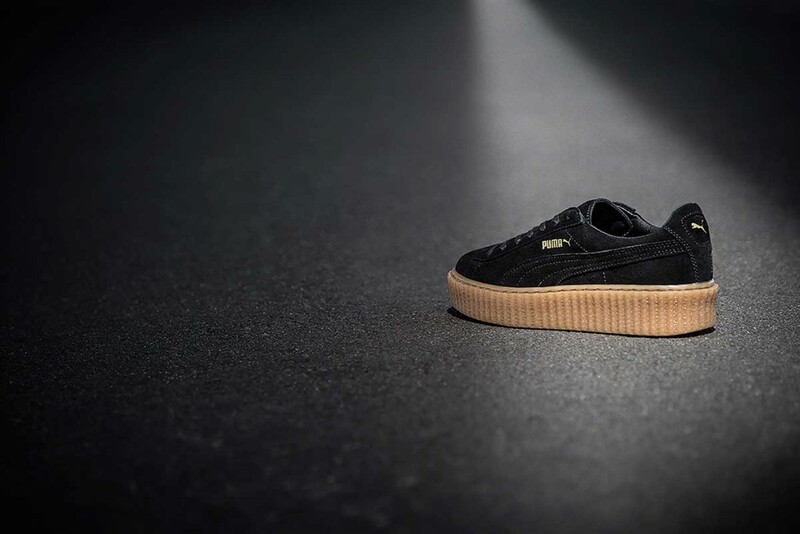 The platform sole on the Creeper is about 2-3″ in height and features a deep ridged design. The design seems to have done its job. It is a startling change to the suede design and has elicited responses from, “I must have!” to “What are these?” Those types of comments means that Rihanna has left her mark. The three colorways available are all-black, oatmeal, and a black with a white PUMA stripe. Although I find the shoe a bit hard to swallow, I do like many of its features. The sole, while thick, does give respect to the original gum soles of the suedes. Also, the materials used look to be top-notch. If I had to choose a colorway, the oatmeal would be my choice as I like how the all-over color makes the sole look a less tall. While these shoes may not be everyone’s style, I believe the release did its job. Some sites state they are giving the Yeezy Boosts a run for their money due to their popularity. They are so popular the shoes sold out in a matter of hours and are currently hard to find. Rumors are that new colorways may be coming in November. Additionally, they have already been seen on various celebrities – Zendaya being one of them. While Zendaya may be a Disney star, she is seen a fashion icon and influential to teens and early-20-somethings. That’s a market that PUMA hasn’t had a lot of success with lately and this release may go a long way in gaining their attention. Even though this release may not be everyone’s style, it will be interesting to see what Rihanna does next for PUMA. Her style is completely different than Solange’s and together, these strong women are showcasing styles that women can identify with and want in their closet.